What is Different About our Rental Properties? Sutton Rentals are Investor owned properties across the Greater Toronto Area. These are not properties in all "rental" buildings. Often times they are vacant, we allow the existing tenant to move, we have our crews go in and prepare the property and then viewings begin. So if you are worried you need a property within a week or 30 days, we can usually help. Many of our Investors plan on holding their properties for a long period of time and a minimum of 1 year lease is prefered. In some situations these tenants have the first opportunity to purchase the property. Inventory can change daily so visit us often. Things you should know about Renting from an Inventor. Frequently Asked Questions about Rentals. Looking for a Rental? Our Service is Completely Free! Give us at call 416-896-3333 we cover the entire GTA including Waterfront Condos for Rent, Mississauga Condos for Rent including the Absolute Building, Living Arts, Duke of York and Prince of Wales. Many are vacant and move in dates can be almost immediate. Moving to Canada? Questions about how our rental market works? Relocating to Ontario, the Toronto or surrounding areas? Renting may be the ideal situation until you decide which community you would like to live long term. Click here for frequently asked questions about our rentals or feel free to call us at 905-896-3333 or 416-896-3333. Our staff will be happy to provide you with rental and community information to help you make a decision on the right location. Ask for Our Welcome to Canada package. Do You Know Your Credit Score? It May Affect Your Interest When Purchasing A House! Featuring: Homes for Lease Rent in Toronto, Toronto Condos for Rent, Detached Homes for Rent in Mississauga, Oakville, Brampton, Milton. Condominium rentals in Square One, Mississauga. Townhomes for rent in the Greater Toronto Area. Mississauga Rentals, Oakville Rentals, Milton Rentals, Brampton Properties for Lease. 2 Bedroom 2 Bath Condos for rent in the Square One Area. Super Wide Search Area - Loads of Inventory! To search hundreds of Rental Homes and Condos by Map - click map below ... remember to check mark " FOR LEASE properties and enter your price point to narrow down search ... our inventory changes daily! See your personal Credit Report by visiting Equifax Online today. Things you should know about Renting from an Investor. Frequently Asked Questions about Rentals. Toronto Corporate Relocation Company. Moving to Toronto? No sure where to Start? Our full Service Rental Department will help you find the Perfect New Home. Our Rental Department coverings houses and condominiums across the entire GTA, from downtown Toronto to the suburbs of Oakville, Ontario. What to Expect when moving to Toronto? Our downtown Toronto Condos are investor owned suites traditionally starting from $1400. Don't be surprised at Toronto Condo sizes ... The newer Toronto Condomiums start around the 450 square footage range for a bachelor apartment but we do offer much larger floor plans. If you are not sure where to start - call or email our full Service Relocation Department 416-896-3333. 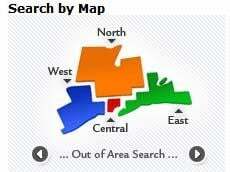 We will help you find the perfect area.